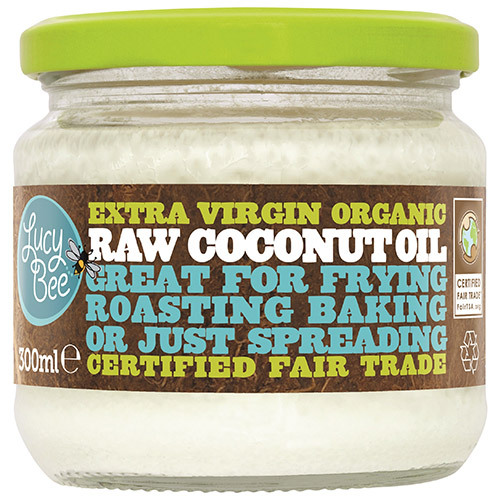 Lucy Bee`s Extra Virgin Organic Raw Coconut Oil is a nutritious dietary oil made from organically grown coconuts. Great for frying, roasting, baking or just spreading. This coconut oil is a Fair Trade product, the aim of which is to improve workers, farmers and producers quality of life through sustainable community development. Lucy Bee believe that eating natural, unprocessed foods makes us healthier from the inside out. In their quest to bring you ingredients of the highest quality, they have developed relationships with suppliers around the world who can support their Fair Trade policy. 100% Organic Raw Coconut Oil. Great for frying, roasting, baking or just spreading. Can also be used in smoothies, coffee or green tea as a natural sweetener, or as a natural beauty product! No refrigeration required, even after opening. Solid at room temperature, melts at 24°C. Below are reviews of Lucy Bee Extra Virgin Organic Raw Coconut Oil - 300ml by bodykind customers. If you have tried this product we'd love to hear what you think so please leave a review. Excellent coconut oil. I use it for cooking and oil pulling mainly. It has a very pleasant taste which is also good in coffee. Great product for cooking and baking with, and for skin care however disappointed that the best before date is only 3 months away. Very happy with product. I will definitely buy again. 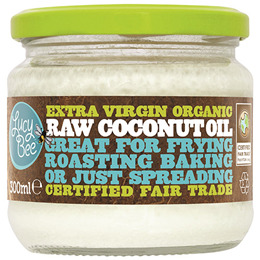 I was delighted with my purchase Lucy Bee Extra Virgin Organic Raw Coconut Oil have been using it for 2 years it's the Best coconut oil l wouldn't buy anything else l use it for loads of things cooking make up remover hair conditioner, lip balm condition nails, hands, feet, dark circles under eyes, oil pulling - after l brush my teeth use a tablespoon swish it round your mouth for 15 mins spit it out into the garbage bin as it will block your sink the list goes on - was delighted with the price and delivery, will purchase again, highly recommended. I really love this coconut oil. I have used it for cooking and with essential oils to put on my skin. Will definitely buy again. One of the very few Extra Virgin Organic Raw Coconut oils that is also fairtrade! Great product very healthy oil to use in cooking or even as alternative to butter/spreads on bread etc. We use for nearly all cooking which requires oil to be heated up to high temperatures (frying/baking) - this is because this oil remains in a 'safe state' which is still healthy for you, also makes cleaning baking trays and frying pans much easier to clean than conventional cooking oils. Also great for various skin conditions etc when applied topically. I've tried various coconut oils. This Lucy Lucy Bee organic coconut oil is the best tasting oil I've used, especially if you like the natural flavour of coconut.